What do good relationships look like? I mean, what do REALLY good relationships look like? When I think of successful relationships, I think of elderly people. (Yeah, hear me out on this one.) I was walking out of Target the other night, bag dangling on one hand and was walking out behind this elderly couple. They were probably in their 70s, but they were holding hands as they shuffled out the door. I couldn’t help it – I smiled. Because longevity is something that’s pretty endearing when it comes to relationships. With half of all marriages ending in divorce these days, to see a couple who have made their relationship work for decades? Well, it’s inspiring, at least to me. But there was something pretty poignant that Abed said in regards to relationships about what successful ones need to function – a balance between one partner who is more logical, and one who is emotional. And truly, if you examine any relationship or friendship, you’ll find this to be accurate. There’s a reason, after all, for the saying “opposites attract.” Two emotional people would not provide the basis for a very stable relationship. Nor would two extremely logical people. (There are, I am sure, exceptions so if you and your mate both tend to be logical or emotional, please don’t send me nasty emails.) As a general rule, however, there needs to be a balance of both to create the foundation for a stable relationship. Logical people help ground emotional people. And emotional people? They help logical people learn how to be free, to dream. So now that this introduction is almost over, think about which type of person YOU are, and hit the comments afterward to discuss. But also – think about the relationships on this show and which category you’d place each of the Greendale Seven into. Who knows – I MAY bring them up later on! Also, I’d like to say that I appreciate Maggie Badur SO MUCH. And I absolutely loved how this episode worked on a surface level with the Greendale characters, but how it also said a LOT about Doctor Who, too. And I know, from yesterday’s tweet with Bobrow, that she is a huge Whovian. So even though you’re not on Twitter, Maggie, know I loved this episode and all of the depth you brought to it. So I'm giving you a gold star. And a lot of kudos. And maybe cookies. Abed and Jeff walk into the study room together, as the latter left his sunglasses in the room and needs them for the trip. When Abed notes that he won’t NEED sunglasses for InspecTiCon, Jeff agrees – he’s not GOING to the convention. He and Annie are driving up with everyone and staying in the same hotel, but they’re going skiing instead (a nice reminder that yes, this show IS set in Colorado). Okay, look… I’m going to discuss Jeff and Annie. If you have a problem with that, you can stop reading now and I will not be offended. I’ll be more offended if you berate me in the comments section when I am providing a disclaimer. So, consider this a disclaimer! I think it’s really interesting that Jeff and Annie were planning to spend the entire weekend together. Yes, they had separate hotel rooms (a fact stated later in the episode), but I really enjoyed this and not because I love Jeff/Annie, necessarily, but because… when was the last time we saw them HANGING OUT together? Wrack your brains, readers, for the last time Jeff and Annie did something that wasn’t related to school. Jeff didn’t help her move (not until the very end, at least). They’ve cracked conspiracies together, solved Biology crimes, and broke into the school. They ate pizza with the rest of the group at Troy and Abed’s apartment after they were expelled but… I miss Jeff and Annie’s friendship. Because if what my mother says is true (and, let’s face it… it probably IS), then the best relationships start out as friendships. And Jeff and Annie? They haven’t always had a solid friendship. They kissed at the end of the first season. Until that point, they’d been friendly, a bit flirty, and Jeff had always gone to Annie to act as his conscience. But the second season destroyed nearly all hope for any solid Jeff/Annie or Annie/Britta friendship. Season three was all about reparation, and this season? I believe this season can be summed up as: “Moving forward from where we are.” So the fact that Jeff wanted to spend time with Annie over the weekend, just the two of them, and that Annie agreed? Well, it’s got romantic undertones, but also speaks really strongly of the desire to be closer as friends. The pair finds Pierce in the study room who got there early to save his seat (… on the weekend…) and overhears Abed and Jeff talking about the road trip, then demands to know why he wasn’t invited. … you guys really learned nothing from the Dungeons & Dragons game, did you? INVITE PIERCE TO YOUR CRAP. I do always feel bad for Pierce because he is consistently left out. Of course, he quickly learns that he’s not the ONLY person who is left out from the group outing. Which sort of eases his nerves… and then springs him to action. At the convention, Abed, Troy, and Britta are wandering the floor and Troy – insistent on trying to please Abed – notes that Britta can stay in the car if the film student wishes. Abed says that Britta can stay, however. Poor Britta almost gets left out by Troy who, very soon, will need her to be there for him. And actually, that’s something really endearing about Britta. We’ve never seen her in an established relationship where she’s actually committed. We usually think of her as we do Jeff – someone who would rather have dates than relationships. And the blonde has PLENTY of reason this episode to ditch Troy altogether. He shoves her (literally) out of a window. He tells Abed that he’d be okay with leaving Britta in the car. (Which, when you write it down… sounds kind of like a jerky boyfriend!) And Britta, because she cares SO much for Troy, stays by him and helps HIM out, even though he kind of didn’t deserve it at first. Someone online pointed out that Britta is basically Minerva, the only female Inspector (who everyone hates, not because she’s female but because she’s the worst), which I did not notice but love the idea of. 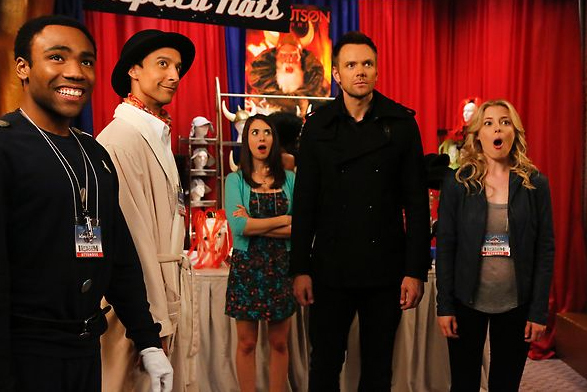 Anyway, Britta seems to want to learn more about Minerva and Abed doesn’t like that Inspector at all. When Britta stares down Abed, we presume that the film student is going to be unrelenting… but then he acknowledges that Britta’s opinion is just as valid as his own, and Troy is terrified at this change in his best friend, assuming something must be wrong. When Jeff discovers that the ski slope is closed for the weekend, he tries to convince Annie to leave the convention and drive back to Greendale. The young woman insists that she wants to stay and Jeff essentially tells her that she’s on her own and the hotel rooms are under his name. Before leaving, however, he realizes why everyone at the convention is staring at him – Jeff bears an uncanny resemblance to the Inspector’s arch-nemesis, Thoraxis. Right off the bat, none of us like Toby. He’s a total Minerva. He approaches the group and doesn’t even acknowledge Troy, but pulls Abed away from his best friend to attend a panel that he got tickets to. And in a total role reversal, ABED is the one who is abandoning TROY. Shirley and Pierce arrive at the convention and I love that Shirley agreed to ride in a car (for who knows how long) with Pierce to attend the InspecTiCon. And, seemingly, the reason that Shirley came was because Pierce told her Troy and Abed wanted them there. And I think that’s rather endearing, that Shirley would drop whatever plans she had that weekend at the notion that Troy and Abed wanted her to be somewhere with them/for them. Nevertheless, Pierce is lying and wants to be included. (Seriously, didn’t the group learn their lesson from Dungeons & Dragons? Paintball? “Biology 101”? LAST WEEK? Pierce wants to be INCLUDED. He wants to feel like a PART of the group.) But they get ushered off the floor by two officials and don't know WHY. In “Mixology Certification,” Annie spends the entire evening assuming Caroline Decker’s persona. Why? Because, as she reveals, she doesn’t know WHAT she wants in life and that terrifies her. She pretended to be another person because she, as she tells Troy, wasn’t sure who she was. Annie may be the most book-smart of the entire group, but she’s also extremely scared of her future because she doesn’t know what it will hold. In that same vein, “History 101”revealed to us a conversation between Annie and Shirley where the former seems to lament her entire career choice. She talks, begrudgingly and with great stress, about the next ten years of her life. Shirley is baffled – doesn’t Annie WANT to be in health care management? The truth is that we all long for a perfect life, and Annie’s life has always been ordered (she “likes things to be well-ordered” and if you get that reference, I will give you an Internet hug), and neat and perfect. Ever since rehab, and perhaps BECAUSE of rehab, she’s established it that way. She doesn’t like uncertainty. She doesn’t like the unknown. And sometimes, maybe, it’s better to live in a fantasy than to accept the hurt in reality. Because that’s what Annie WAS when she was sitting on that bed – hurt. Jeff said he wanted to spend time with her, but took the first means of escape. He would have rather returned to Greendale than spend a weekend with Annie at InspecTiCon. Doesn’t THAT deserve our pity? Annie’s not crazy. She’s not immature. She hasn’t “regressed.” She was hurt. She is human. Aren’t we all? In the hotel bar, Jeff is (what else?) texting when an attractive woman and rabid Inspector Spacetime fan, Lauren, approaches him and incorrectly assumes that he is the actor who plays Thoraxis. Jeff eats up the attention and plays along. Joel/Jeff’s British accent is SO cringe-worthy that it’s hilarious. And I think that’s exactly how it was intended to be, because his British accent is usually better* on The Soup. Elsewhere, Pierce and Shirley have been pulled aside by some important-looking people working the convention floor. The pair assumes they’re being reprimanded, but are actually asked to be a part of a focus group for an American version of Inspector Spacetime. Meanwhile, Troy is still having a hard time with Toby and Abed’s budding relationship, as the two are finishing each other’s thoughts and sentences over lunch and then ditch Britta and Troy when they see the actor who plays the Inspector walk in. I also love that Britta helps Troy out this entire episode and tells him how to handle the situation (which he does… poorly). And really, she’s trying to preserve Troy and Abed’s friendship because she knows that even though she’s an important part of Troy’s life, Abed is always his first priority. And therefore, Abed has become HER first priority. God, that’s beautiful. Britta trying to help was actually kind of helpful – she does admit that Troy cannot rage his emotions at Abed, even though he’s feeling both angry and sad. She knows that blowing up will only push Abed further away and toward Toby. The blonde, of course, completely Britta’d the saying about setting the people you love free. She is half-right in this assumption: she knows that Troy cannot push Abed too much, but she doesn’t affirm the necessity for Troy to convey his feelings in a rational, mature way. Okay, maybe that’s my ONLY Britta characterization quip this episode. Troy does, in fact, take some of Britta’s advice and decides it is best for himself and Abed to try and befriend Toby. It… doesn’t work so well. He actually turns into the “crazy girlfriend” that Britta warns him he’d become. It’s interesting that Jeff meets someone, Lauren, who is attractive who he actually is trying to get to know, and presumes that the only way she could possibly be interested in Inspector Spacetime is if she had issues as a child with her self-esteem. I guess he sees Troy and Abed as being able and willing to latch onto this phenomenon because it somehow makes them feel… cool, unlike how they felt as children. Like they get a second chance at childhood or something. Speaking of the duo in question, Abed and Toby are attending the panel when Troy interrupts and then proceeds to have an outburst when Toby “forgets” his name. After the athlete departs, Toby tells Abed that he should join him in London for the special 50th anniversary convention of Inspector Spacetime. Abed, while excited, seems a bit hesitant. Upstairs, Annie and Randy, the doorman, are discussing her “husband,” when Randy brings Annie a hair dryer. And let’s just read the subtext of Annie’s conversation with Randy, shall we? I feel like Annie really WAS hoping that she and Jeff could just spend time together on the trip and that he’d learn to see her as his friend again (and yes, maybe as a woman too, rather than a little girl). And if Jeff had any reason to never want to spend time with Annie again… it’d probably be for throwing scotch in his face and pretending to be married to him. But we’ll get to that soon, don’t worry. I love that, in the focus group, Shirley is defending Inspector Spacetime as Troy and Abed love it… and also trying to tell Pierce how wrong he is. But Pierce is insistent that his changes are for the better (they’re not) and continues to tell the leaders of the group changes that should be made to improve the show. It’s also a fun commentary on how when British shows or movies become American-ized, we ruin EVERYTHING. Let me be honest: this line kind of broke my heart. Here Annie is, trying to have this pretend life because she’s not sure what to really make of her own and it scares her, and everyone at the hotel thinks she’s the best. SO MUCH SO that Randy shows her Jeff’s “infidelity.” These people, these complete strangers, care so much about Annie and she feels slighted by the person who has known her for four years and was supposed to be her friend and care about spending the weekend with her. Who abandoned her because he didn’t get his way. Who, in Annie’s mind, essentially was only there for the weekend to ski. It didn’t matter that he was with ANNIE – he cared about what he wanted to DO not who he was WITH. And so, Annie gets a bit miffed at Jeff. I’d argue that she’s rightfully upset. So she continues the charade of marriage and throws a drink in Jeff’s (very confused and slightly agitated) face. Lauren, shocked that Neil/Thoraxis is MARRIED, also throws a drink in his face. Jeff is not amused and goes upstairs in a huff to towel-dry his face off. Troy is sulking on the convention floor, distressed that he’s ruined his relationship with Abed, seemingly, and scared him away. Britta approaches him with a present, which immediately cheers him up. (Also, Britta shooing away all of the boys who followed her around? HILARIOUS.) When she called Troy “honey,” I think I just melted. Also, ALSO… Britta, who could care less about Inspector Spacetime, is going to great lengths to make Troy feel better. She tells him that everyone messes up and it’s not his fault. She basically does everything in this episode BECAUSE she cares about Troy so much. What I really love about the third act in the Abed/Toby story is that Abed has clearly evolved as a character. He trusts Troy and his friends now, and recognizes that they care about him too. Troy doesn’t want to control him… he CARES about him. And Abed clearly recognizes the differences between the two when he calls Toby out on his lies. Toby tries to appeal to Abed’s rational side – a side, I’d argue, I was afraid would win in this episode (look at “Virtual Systems Analysis,” where Abed acknowledges his superiority to his friends). So when Toby tries to manipulate Abed by insisting that Troy will eventually leave him now that he’s got a girlfriend… well, Abed isn’t buying it. Honestly, this episode was the first time in a LONG time that I really have loved Abed as a character. The best part of this exchange was that Abed recognizes that Toby’s manipulation is rooted in the idea that logical people need other logical people and ONLY those people. That emotional beings are somehow weaker – that the smart must stick together, because people like Toby and Abed are BETTER. Other people have lives that move and change. But, Toby insists, Abed and he are not like most people. They cannot rely on the emotional “friends” because they’ll be abandoned every time. And this is where Abed makes his poignant observation – emotional people ARE needed. Even the most logical being (The Inspector/The Doctor) traveled with humans. He didn’t, as Abed points out, travel with other people of superior intellect. He traveled with the companions who would remind him of his own humanity, who would humble and ground him and “keep him invested in the world” (a beautiful, mind you, commentary from Maggie Bandur about Doctor Who, as she is a Whovian). All relationships ARE made up of logical Inspectors and emotional Constables. Jeff is logical; Annie is emotional. Britta is logical; Troy is emotional. Troy is emotional; Abed is logical. Shirley is logical; Pierce is emotional. See? The reason that these relationships function is simple – balance. Unfortunately for him, Abed's revelation gets him locked inside a DARSIT by Toby. Uh-oh. But the film student remains confident that his best friend, the constant in his life, will not abandon him. Because the one thing Abed learned in this episode? Change happens. You cannot prevent change from occurring. BUT that doesn't mean that there aren't also constants that co-exist with change. And the one constant in Abed's life? Troy will always rescue him. As Jeff towel dries off in his room, he heads into the adjoining room looking for Annie and sees… all of the things that the hotel staff bestowed upon “Mrs. Winger.” He returns downstairs to find her and confronts her about the hotel room. Poor Annie think she’s ruined everything – she thinks that Jeff will assume that she’s insane for following along with the concierge’s assumptions and constructing a fake life, but she’s not AFRAID to tell him, which is really bold and wonderful. Remember that Annie was there to witness Jeff’s breakdown over marriage. She knows how he feels. She knows he gets scared and weird and probably thinks the same thing about her. But she admits to him, anyway, that she’s daydreamed about marrying him and Troy and… well, okay, mostly just Zac Efron. And Jeff doesn’t get scared or creeped out. He doesn’t belittle her or call her a child. He doesn’t run away. And she continues to freely admit that she was hurt that he ditched her (and you can see him swallow in guilt at that), because in spite of what they are or are not romantically, Annie was stung that Jeff would blow a weekend of friendship off with her… just because he didn’t want to spend time together. The pair gets ENDEARINGLY flirty then, and Jeff admits that he wants to hang out with Annie but some things she thinks are fun he thinks are lame (and they address their age difference AND IT'S NOT CREEPY). I mentioned this before but… this whole exchange was so adorably flirtatious. You could tell Jeff wanted to do everything he could to make his behavior up to her and when she ordered a girly drink, he was frustrated only until Annie asked with her soft, flirtatious tone: “Please?” and then Jeff took one look at her, got up, and ordered a drink. And you can tell she gets a kick out of the fact that he’ll have to order it for her. - The entire montage of Britta getting dressed (including SWINGING ON A ROPE, swinging by Annie’s room, and grabbing donuts) is HILARIOUS. - I WOULD like to attend that panel. I’m bummed we didn’t get to actually SEE Travis as the Inspector either. - Inspector Spacetime: American Edition is called Epochs of Eternity. - Be sure to always read the chalkboards and also pay attention to some special little meta jokes the writers drop into episodes like this. - “I’m going to go upstairs, towel off, and pray to GOD that I wake up in the middle of a final for a class I didn’t know I was enrolled in.” This is the epitome of Greendale. - “You know, for the first time in my LONG history of being locked inside things… I knew someone would come.” AND THAT'S WHEN I COOED. - The American version of Inspector Spacetime is HILARIOUSLY AWFUL. Thank you all for reading this VERY long blog-review (I just have a lot of feelings, okay?) Come back next week when I review "Alternative History of the German Invasion" which marks the return of our favorite annoying German foosball players! I think you convinced me to like Annie's role in the episode. I've noticed a trend to treat Annie as a child so that there are no Jeff/Annie sparks and there's no worries of a giant ship collision that would set fire to the sea. They did this in History 101 with the need to do a prank (which is understandable, but it still was a C plot that wasn't really necessary - we've had episodes where one or another cast member has been almost absent [see "Conspiracy Theories and Interior Design," where Britta mostly drank a martini in the blanket fort], so it would have been okay to let Annie and Shirley not have much screentime with the caveat that a good episode would feature them prominently in the future - whoa, long diatribe), but I also saw it in "Geography of Global Conflict" as well, which was basically Dan saying "yes, this is hot, but we're not touching it. But you give really good reasons for her behavior, which I hadn't considered. I love how much Britta understands Troy and Abed's relationship. While I love the Troy-Abed-Annie trio, I don't think it would work if the dynamics changed and the show went Annie/Abed, because Annie would expect Abed to be a boyfriend instead of just a friend, and wouldn't get the reason why her *boyfriend* has such a deep connection with Troy. But Britta gets it - she leaves Troy and Abed to do their thing, is there for Troy when he needs her, but ultimately accepts that if they get married, Abed would probably come along on the Honeymoon (documentary camera at hand). in love spell, but i had no other choice, than to follow her advice. wife,and brought great joy to my family once again.